Theodor Seuss Geisel (/ˈsɔɪs/ Listeni/ˈɡaɪ.zəl/; March 2, 1904 – September 24, 1991) was an American writer and illustrator best known for authoring popular children’s books under the pen name Dr. Seuss (/suːs/). His work includes several of the most popular children’s books of all time, selling over 600 million copies and being translated into more than 20 languages by the time of his death. Geisel adopted his “Dr. Seuss” pseudonym during his university studies at Dartmouth College and the University of Oxford. After leaving Oxford in 1927 he began his career as an illustrator and cartoonist for Vanity Fair, Life, and various other publications. He also worked as an illustrator for advertising campaigns, most notably for Flit and Standard Oil, and as a political cartoonist for the New York newspaper PM. He published his first children’s book, And to Think That I Saw It on Mulberry Street, in 1937. During World War II he worked in an animation department of the United States Army, where he produced several short films, including Design for Death, which later won the 1947 Academy Award for Documentary Feature. After the war Geisel focused on his children’s books, writing classics such as If I Ran the Zoo (1950), Horton Hears a Who! (1955), If I Ran the Circus (1956), The Cat in the Hat (1957), How the Grinch Stole Christmas! (1957), and Green Eggs and Ham (1960). He published over 60 books during his career, which have spawned numerous adaptations, including 11 television specials, four feature films, a Broadway musical and four television series. He won the Lewis Carroll Shelf Award in 1958 for Horton Hatches the Egg and again in 1961 for And to Think That I Saw It on Mulberry Street. Geisel’s birthday, March 2, has been adopted as the annual date for National Read Across America Day, an initiative on reading created by the National Education Association. Theodor Seuss Geisel was born in Springfield, Massachusetts, to Theodor Robert and Henrietta (née Seuss) Geisel. All of his grandparents were German immigrants. His father managed the family brewery and was later appointed to supervise Springfield’s public park system by Mayor John A. Denison after the brewery closed because of Prohibition. Mulberry Street in Springfield, made famous in Dr. Seuss’ first children’s book And to Think That I Saw It on Mulberry Street!, is less than a mile southwest of his boyhood home on Fairfield Street. Geisel was raised a Lutheran. Geisel enrolled at Springfield Central High School in 1917 and graduated in 1921. He took an art class as a freshman and later became manager of the school soccer team. Geisel attended Dartmouth College, graduating in 1925. At Dartmouth, he joined the Sigma Phi Epsilon fraternity and the humor magazine Dartmouth Jack-O-Lantern, eventually rising to the rank of editor-in-chief. While at Dartmouth, Geisel was caught drinking gin with nine friends in his room. As a result, Dean Craven Laycock insisted that he resign from all extracurricular activities, including the college humor magazine. To continue work on the Jack-O-Lantern without the administration’s knowledge, Geisel began signing his work with the pen name “Seuss”. Geisel was encouraged in his writing by professor of rhetoric W. Benfield Pressey, whom he described as his “big inspiration for writing” at Dartmouth. Upon graduating from Dartmouth, he entered Lincoln College, Oxford, intending to earn a PhD in English literature. At Oxford, he met Helen Palmer, who encouraged him to give up becoming an English teacher in favor of pursuing drawing as a career. In early 1928, one of Geisel’s cartoons for Judge mentioned Flit, a common bug spray at the time, manufactured by Standard Oil of New Jersey. According to Geisel, the wife of an advertising executive in charge of advertising Flit saw Geisel’s cartoon at a hairdresser’s and urged her husband to sign him. Geisel’s first Flit ad appeared on May 31, 1928, and the campaign continued sporadically until 1941. The campaign’s catchphrase, “Quick, Henry, the Flit!”, became a part of popular culture. It spawned a song and was used as a punch line for comedians such as Fred Allen and Jack Benny. As Geisel gained notoriety for the Flit campaign, his work was sought after and began to appear regularly in magazines like Life, Liberty, and Vanity Fair. Geisel supported himself and his wife through the Great Depression by drawing advertising for General Electric, NBC, Standard Oil, Narragansett Brewing Company and many other companies. In 1935, he wrote and drew a short-lived comic strip called Hejji. The increased income allowed the Geisels to move to better quarters and to socialize in higher social circles. They became friends with the wealthy family of the banker Frank A. Vanderlip. They also traveled extensively: by 1936, Geisel and his wife had visited 30 countries together. They did not have children, neither kept regular office hours, and they had ample money. Geisel also felt that the traveling helped his creativity. In 1936, while the couple was returning from an ocean voyage to Europe, the rhythm of the ship’s engines inspired the poem that became his first book, And to Think That I Saw It on Mulberry Street. Based on Geisel’s varied accounts, the book was rejected by between 20 and 43 publishers. According to Geisel, he was walking home to burn the manuscript when a chance encounter with an old Dartmouth classmate led to its publication by Vanguard Press. Geisel wrote four more books before the US entered World War II. This included The 500 Hats of Bartholomew Cubbins in 1938 as well as The King’s Stilts and The Seven Lady Godivas in 1939, all of which were, atypically for him, in prose. This was followed by Horton Hatches the Egg in 1940, in which Geisel returned to the use of poetry. Geisel gained a significant public profile through a program for motor boat lubricants produced by Standard Oil under the brand name Essomarine. He later recounted that Harry Bruno, Ted Cook, and Verne Carrier worked with him for exhibits at the National Motor Boat Show called the Seuss Navy. In 1934, Geisel produced a 30-page booklet entitled Secrets of the Deep, which was available by mail after June. At the January boat show for 1935, visitors filled out order cards to receive Secrets. Geisel drew up a Certificate of Commission for visitors in 1936. A mock ship deck called SS Essomarine provided the scene where photos of “Admirals” were taken. That summer Geisel released a second volume of Secrets. For the 1937 show, he sculpted Marine Muggs and designed a flag for the Seuss Navy. The following year featured “Little Dramas of the Deep”, a six-act play with ten characters. According to Geisel’s sister, “He plans the whole show with scenery and action and then, standing in a realistic bridge, reels off a speech which combines advertising with humor.” For 1939, exhibitors made available the Nuzzlepuss ashtray and illustrated tide-table calendars. On January 11, 1940, at the Waldorf-Astoria Hotel, a Seuss Navy Luncheon was held. At that year’s boat show, Geisel provided the Navigamarama exhibit and the Sea Lawyers Gazette. The final contribution to the Essomarine project, in 1941, was the mermaid Essie Neptune and her pet whale. The exhibit offered photos for a Happy Cruising passport. As World War II began, Geisel turned to political cartoons, drawing over 400 in two years as editorial cartoonist for the left-leaning New York City daily newspaper, PM. 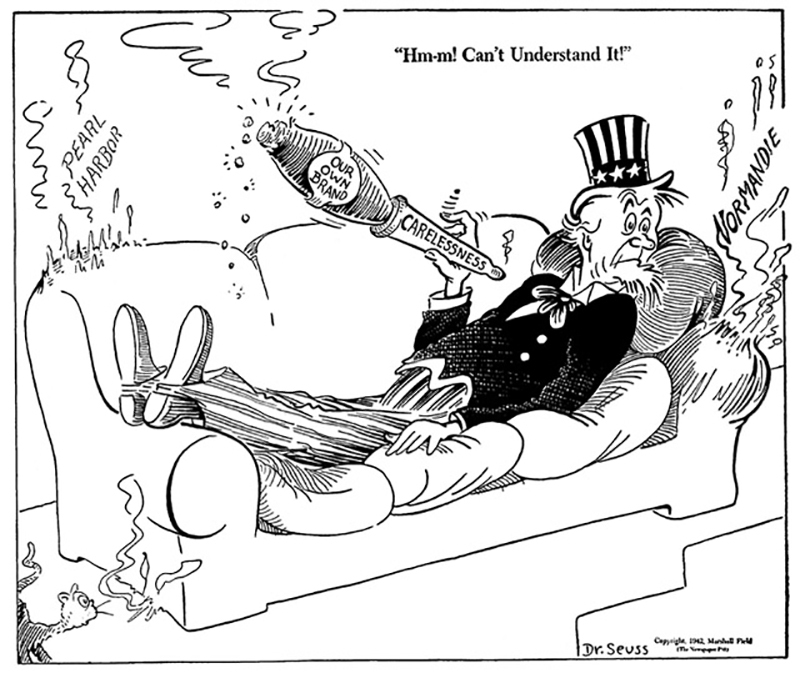 Geisel’s political cartoons, later published in Dr. Seuss Goes to War, denounced Hitler and Mussolini and were highly critical of non-interventionists (“isolationists”), most notably Charles Lindbergh, who opposed US entry into the war. 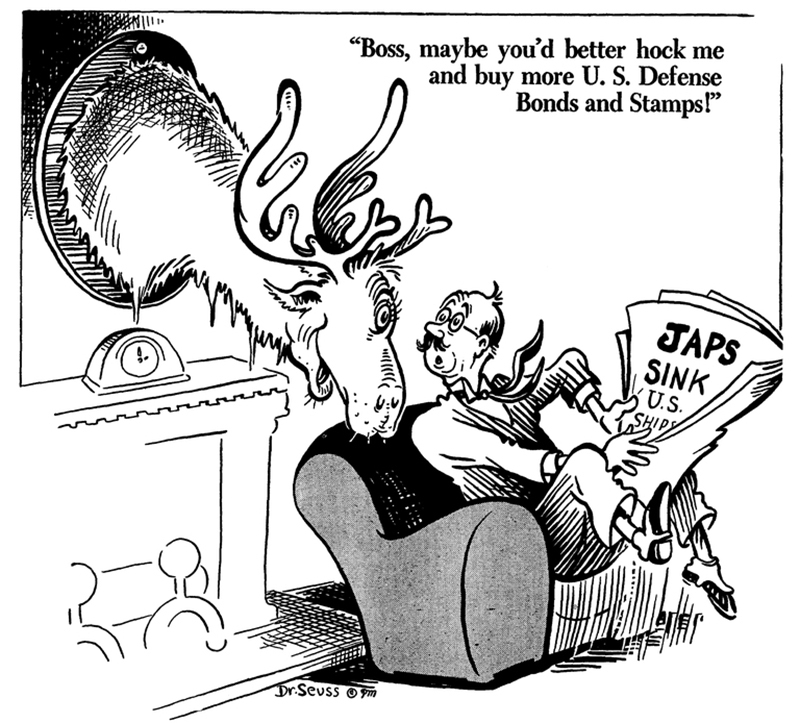 One cartoon depicted all Japanese Americans as latent traitors or fifth-columnists, while at the same time other cartoons deplored the racism at home against Jews and blacks that harmed the war effort. His cartoons were strongly supportive of President Roosevelt’s handling of the war, combining the usual exhortations to ration and contribute to the war effort with frequent attacks on Congress (especially the Republican Party), parts of the press (such as the New York Daily News, Chicago Tribune and Washington Times-Herald), and others for criticism of Roosevelt, criticism of aid to the Soviet Union, investigation of suspected Communists, and other offences that he depicted as leading to disunity and helping the Nazis, intentionally or inadvertently. In 1942, Geisel turned his energies to direct support of the U.S. war effort. First, he worked drawing posters for the Treasury Department and the War Production Board. Then, in 1943, he joined the Army as a Captain and was commander of the Animation Department of the First Motion Picture Unit of the United States Army Air Forces, where he wrote films that included Your Job in Germany, a 1945 propaganda film about peace in Europe after World War II; Our Job in Japan, and the Private Snafu series of adult army training films. While in the Army, he was awarded the Legion of Merit. Our Job in Japan became the basis for the commercially released film, Design for Death (1947), a study of Japanese culture that won the Academy Award for Documentary Feature. Gerald McBoing-Boing (1950), which was based on an original story by Seuss, won the Academy Award for Animated Short Film. After the war, Geisel and his wife moved to La Jolla, California. Returning to children’s books, he wrote many works, including such favorites as If I Ran the Zoo, (1950), Horton Hears a Who! (1955), If I Ran the Circus (1956), The Cat in the Hat (1957), How the Grinch Stole Christmas (1957) and Green Eggs and Ham (1960). Although he received numerous awards throughout his career, Geisel won neither the Caldecott Medal nor the Newbery Medal. Three of his titles from this period were, however, chosen as Caldecott runners-up (now referred to as Caldecott Honor books): McElligot’s Pool (1947), Bartholomew and the Oobleck (1949), and If I Ran the Zoo (1950). Dr Seuss also wrote the musical and fantasy film The 5,000 Fingers of Dr. T, which was released in 1953. The movie was a critical and financial failure, and Geisel never attempted another feature film. During the 1950s, he also published a number of illustrated short stories, mostly in Redbook Magazine. Some of these were later collected (in volumes such as The Sneetches and Other Stories) or reworked into independent books (If I Ran the Zoo). A number have never been reprinted since their original appearances. In May 1954, Life magazine published a report on illiteracy among school children, which concluded that children were not learning to read because their books were boring. Accordingly, William Ellsworth Spaulding, the director of the education division at Houghton Mifflin who later became its chairman, compiled a list of 348 words he felt were important for first-graders to recognize and asked Geisel to cut the list to 250 words and write a book using only those words. Spaulding challenged Geisel to “bring back a book children can’t put down”. Nine months later, Geisel, using 236 of the words given to him, completed The Cat in the Hat. It retained the drawing style, verse rhythms, and all the imaginative power of Geisel’s earlier works, but because of its simplified vocabulary, it could be read by beginning readers. The Cat in the Hat and subsequent books written for young children achieved significant international success and they remain very popular today. In 2009, Green Eggs and Ham sold 540,366 copies, The Cat in the Hat sold 452,258 copies, and One Fish Two Fish Red Fish Blue Fish (1960) sold 409,068 copies—outselling the majority of newly published children’s books. Geisel went on to write many other children’s books, both in his new simplified-vocabulary manner (sold as Beginner Books) and in his older, more elaborate style. In 1956, Dartmouth awarded Geisel with an honorary doctorate. He added the “Dr.” to his penname because his father had always wanted him to practice medicine. Geisel received the Laura Ingalls Wilder Medal from the professional children’s librarians in 1980, recognizing his “substantial and lasting contributions to children’s literature”. At the time it was awarded every five years. He won a special Pulitzer Prize in 1984 citing his “contribution over nearly half a century to the education and enjoyment of America’s children and their parents”. Geisel died of oral cancer on September 24, 1991, at his home in La Jolla at the age of 87. He was cremated and his ashes were scattered. On December 1, 1995, four years after his death, University of California, San Diego’s University Library Building was renamed Geisel Library in honor of Geisel and Audrey for the generous contributions they made to the library and their devotion to improving literacy. While Geisel was living in La Jolla, the United States Postal Service and others frequently confused him with another La Jolla resident, Dr. Hans Suess. Their names have been linked together posthumously: the personal papers of Hans Suess are housed in the Geisel Library. In 2002, the Dr. Seuss National Memorial Sculpture Garden opened in his birthplace of Springfield, Massachusetts; it features sculptures of Geisel and of many of his characters. On May 28, 2008, California Governor Arnold Schwarzenegger and First Lady Maria Shriver announced that Geisel would be inducted into the California Hall of Fame, located at The California Museum for History, Women and the Arts. The induction ceremony took place December 15 and his widow Audrey accepted the honor in his place. On March 2, 2009, the web search engine Google temporarily changed its logo to commemorate Geisel’s birthday (a practice it often follows for various holidays and events). In 2004, U.S. children’s librarians established the annual Theodor Seuss Geisel Award to recognize “the most distinguished American book for beginning readers published in English in the United States during the preceding year”. It should “demonstrate creativity and imagination to engage children in reading” during years pre-K to grade two. At his alma mater, Dartmouth, where over 90% of incoming first-year students participate in pre-registration Dartmouth Outing Club trips into the New Hampshire wilderness, it is traditional for students returning from the trips to overnight at Dartmouth’s Moosilauke Ravine Lodge, where they are served green eggs and ham for breakfast in honor of Dr. Seuss. On April 4, 2012, the Dartmouth Medical School renamed itself the Audrey and Theodor Geisel School of Medicine in honor of their many years of generosity to the college. Dr. Seuss has a star on the Hollywood Walk of Fame, at the 6500 block of Hollywood Boulevard. Geisel switched to the anglicized pronunciation because it “evoked a figure advantageous for an author of children’s books to be associated with—Mother Goose” and because most people used this pronunciation. For books that Geisel wrote and others illustrated, he used the pen name “Theo LeSieg”, starting with I Wish That I Had Duck Feet, published in 1965. “LeSieg” is “Geisel” spelled backward. Geisel also published one book, 1975’s Because a Little Bug Went Ka-Choo! !, a collaboration with Michael K. Frith, under the name Rosetta Stone. Frith and Geisel chose the name in honor of Geisel’s second wife, Audrey, whose maiden name was Stone. Geisel was a liberal Democrat and a supporter of President Franklin D. Roosevelt and the New Deal. His early political cartoons show a passionate opposition to fascism, and he urged action against it both before and after the United States entered World War II. His cartoons portrayed the fear of communism as overstated, finding greater threats in the House Un-American Activities Committee and those who threatened to cut the US “life line” to Stalin and the USSR, whom he once depicted as a porter carrying “our war load”. But right now, when the Japs are planting their hatchets in our skulls, it seems like a hell of a time for us to smile and warble: “Brothers!” It is a rather flabby battle cry. If we want to win, we’ve got to kill Japs, whether it depresses John Haynes Holmes or not. We can get palsy-walsy afterward with those that are left. Shortly before the end of the 1972–74 Watergate scandal, in which United States president Richard Nixon resigned, Geisel converted a copy of one of his famous children’s books into a polemic by replacing the name of the main character everywhere it occurred. “Richard M. Nixon, Will You Please Go Now!” was published in major newspapers through the column of his friend Art Buchwald. The line “A person’s a person, no matter how small! !” from Horton Hears a Who! has been used widely as a slogan by the pro-life movement in the U.S., despite the objections of Geisel’s widow. In 1986, when the line was first used in such a way, he demanded a retraction and received one. Though Geisel made a point of not beginning the writing of his stories with a moral in mind, stating that “kids can see a moral coming a mile off”, he was not against writing about issues; he said that “there’s an inherent moral in any story”, and he remarked that he was “subversive as hell”. Many of Geisel’s books express his views on a remarkable variety of social and political issues: The Lorax (1971), about environmentalism and anti-consumerism; “The Sneetches” (1961), about racial equality; The Butter Battle Book (1984), about the arms race; Yertle the Turtle (1958), about Hitler and anti-authoritarianism; How the Grinch Stole Christmas (1957), criticizing the materialism and consumerism of the Christmas season; and Horton Hears a Who! (1954), about anti-isolationism and internationalism. Geisel wrote most of his books in anapestic tetrameter, a poetic meter employed by many poets of the English literary canon. This is often suggested as one of the reasons that Geisel’s writing was so well received. Geisel’s earlier artwork often employed the shaded texture of pencil drawings or watercolors, but in children’s books of the postwar period, he generally employed the starker medium of pen and ink, normally using just black, white, and one or two colors. Later books such as The Lorax used more colors. Geisel’s figures are often rounded and somewhat droopy. This is true, for instance, of the faces of the Grinch and of the Cat in the Hat. Almost all the buildings and machinery that Geisel drew were devoid of straight lines, even when he was representing real objects. For example, If I Ran the Circus includes a droopy hoisting crane and a droopy steam calliope. Geisel evidently enjoyed drawing architecturally elaborate objects. His endlessly varied (but never rectilinear) palaces, ramps, platforms, and free-standing stairways are among his most evocative creations. Geisel also drew complex imaginary machines, such as the Audio-Telly-O-Tally-O-Count, from Dr. Seuss’s Sleep Book, or the “most peculiar machine” of Sylvester McMonkey McBean in The Sneetches. Geisel also liked drawing outlandish arrangements of feathers or fur, for example, the 500th hat of Bartholomew Cubbins, the tail of Gertrude McFuzz, and the pet for girls who like to brush and comb, in One Fish Two Fish. Geisel’s images often convey motion vividly. He was fond of a sort of voilà gesture, in which the hand flips outward, spreading the fingers slightly backward with the thumb up; this is done by Ish, for instance, in One Fish Two Fish when he creates fish (who perform the gesture themselves with their fins), in the introduction of the various acts of If I Ran the Circus, and in the introduction of the Little Cats in The Cat in the Hat Comes Back. He was also fond of drawing hands with interlocked fingers, which looked as though the characters were twiddling their thumbs. Geisel also follows the cartoon tradition of showing motion with lines, for instance in the sweeping lines that accompany Sneelock’s final dive in If I Ran the Circus. Cartoonists’ lines are also used to illustrate the action of the senses (sight, smell, and hearing) in The Big Brag and even of thought, as in the moment when the Grinch conceives his awful idea. Geisel’s early work in advertising and editorial cartooning produced sketches that received more perfect realization later in the children’s books. Often, the expressive use to which Geisel put an image later on was quite different from the original. An editorial cartoon of July 16, 1941 depicts a whale resting on the top of a mountain as a parody of American isolationists, especially Charles Lindbergh. This was later rendered (with no apparent political content) as the Wumbus of On Beyond Zebra (1955). Seussian whales (cheerful and balloon-shaped, with long eyelashes) also occur in McElligot’s Pool, If I Ran the Circus, and other books. The tower of turtles in a 1942 editorial cartoon prefigures a similar tower in Yertle the Turtle. This theme also appeared in a Judge cartoon as one letter of a hieroglyphic message, and in Geisel’s short-lived comic strip Hejji. Geisel once stated that Yertle the Turtle was Adolf Hitler. Little cats A B and C (as well as the rest of the alphabet) who spring from each other’s hats appeared in a Ford ad. The connected beards in Did I Ever Tell You How Lucky You Are? appear frequently in Geisel’s work, most notably in Hejji, which featured two goats joined at the beard, The 5,000 Fingers of Dr. T, which featured two roller-skating guards joined at the beard, and a political cartoon in which Nazism and the America First movement are portrayed as “the men with the Siamese Beard”. Geisel’s earliest elephants were for advertising and had somewhat wrinkly ears, much as real elephants do. With And to Think That I Saw It on Mulberry Street! (1937) and Horton Hatches the Egg (1940), the ears became more stylized, somewhat like angel wings and thus appropriate to the saintly Horton. During World War II, the elephant image appeared as an emblem for India in four editorial cartoons. Horton and similar elephants appear frequently in the postwar children’s books. For most of his career, Geisel was reluctant to have his characters marketed in contexts outside of his own books. However, he did allow for the creation of several animated cartoons, an art form in which he himself had gained experience during the Second World War, and gradually relaxed his policy as he aged. The first adaptation of one of Geisel’s works was a cartoon version of Horton Hatches the Egg, animated at Warner Bros. in 1942. Directed by Robert Clampett, it was presented as part of the Merrie Melodies series, and included a number of gags not present in the original narrative, including a fish committing suicide and a Katharine Hepburn imitation by Mayzie. In 1959, Geisel authorized Revell, the well-known plastic-model-making company, to make a series of “animals” that snapped together rather than being glued together, and could be assembled, disassembled and re-assembled “in thousands” of ways. The series was called the “Dr. Seuss Zoo” and included Gowdy the Dowdy Grackle, Norval the Bashful Blinket, Tingo the Noodle Topped Stroodle and Roscoe the Many Footed Lion. The basic body parts were the same and all were interchangeable, and so it was possible for children to combine parts from various characters in essentially unlimited ways in creating their own animal characters (Revell encouraged this by selling Gowdy, Norval and Tingo together in a “Gift Set” as well as individually). Revell also made a conventional glue-together “beginner’s kit” of The Cat in the Hat. In 1966, Geisel authorized the eminent cartoon artist Chuck Jones – his friend and former colleague from the war – to make a cartoon version of How the Grinch Stole Christmas! ; Geisel was credited as a co-producer, along with Jones, under his real name, “Ted Geisel”. The cartoon, narrated by Boris Karloff, who also provided the voice of the Grinch, was very faithful to the original book, and is considered a classic by many to this day; it is often broadcast as an annual Christmas television special. Jones directed an adaptation of Horton Hears a Who! in 1970, and produced an adaptation of The Cat in the Hat in 1971. From 1972 to 1983, Geisel wrote six animated specials, which were produced by DePatie-Freleng: The Lorax (1972); Dr. Seuss on the Loose (1973); The Hoober-Bloob Highway (1975); Halloween Is Grinch Night (1977); Pontoffel Pock, Where Are You? (1980); and The Grinch Grinches the Cat in the Hat (1982). Several of the specials were nominated for and won multiple Emmy Awards. A Soviet paint-on-glass-animated short film called Welcome (an adaptation of Thidwick the Big-Hearted Moose) was made in 1986. The last adaptation of Geisel’s works before he died was The Butter Battle Book, a television special based on the book of the same name, directed by adult animation legend Ralph Bakshi. A television film titled In Search of Dr. Seuss, released in 1994, adapted many of Seuss’s stories. It uses both live-action versions and animated versions of the characters and stories featured; however, the animated portions were merely edited (and, in some cases, re-dubbed as well) versions of previous animated television specials. After Geisel died of cancer at the age of 87 in 1991, his widow Audrey Geisel was placed in charge of all licensing matters. She approved a live-action feature-film version of How the Grinch Stole Christmas starring Jim Carrey, as well as a Seuss-themed Broadway musical called Seussical, and both premiered in 2000. The Grinch has had limited engagement runs on Broadway during the Christmas season, after premiering in 1998 (under the title How the Grinch Stole Christmas) at the Old Globe Theatre in San Diego, where it has become a Christmas tradition. In 2003, another live-action film was released, this time an adaptation of The Cat in the Hat that featured Mike Myers as the title character. Audrey Geisel has spoken critically of the film, especially the casting of Myers as the Cat in the Hat, and stated that she would not allow any further live-action adaptations of Geisel’s books. However, an animated CGI feature film adaptation of Horton Hears a Who! was approved, and was eventually released on March 14, 2008, to critical acclaim. A CGI-animated feature film adaptation of The Lorax was released by Universal on March 2, 2012 (on what would have been the 108th birthday of Seuss). Four television series have been adapted from Geisel’s work. The first, Gerald McBoing-Boing, was an animated television adaptation of Geisel’s 1951 cartoon of the same name and lasted three months between 1956 and 1957. The second, The Wubbulous World of Dr. Seuss, was a mix of live-action and puppetry by Jim Henson Television, the producers of The Muppets. It aired for one season on Nickelodeon in the United States, from 1996 to 1997. The third, Gerald McBoing-Boing, is a remake of the 1956 series. Produced in Canada by Cookie Jar Entertainment (now DHX Media) and North America by Classic Media (now DreamWorks Classics), it ran from 2005 to 2007. The fourth, The Cat in the Hat Knows a Lot About That!, produced by Portfolio Entertainment Inc., began on August 7, 2010, in Canada and September 6, 2010, in the United States and is currently still showing. Geisel’s books and characters are also featured in Seuss Landing, one of many islands at the Islands of Adventure theme park in Orlando, Florida. In an attempt to match Geisel’s visual style, there are reportedly “no straight lines” in Seuss Landing. The Hollywood Reporter has reported that Johnny Depp has agreed to produce and possibly star in a film based on Geisel’s life. The film will be written by Keith Bunin, produced by Depp’s Infinitum Nihil production company alongside Illumination Entertainment and distributed by Universal Pictures.